Kudos to Fred Keller and Judy Foster, of Anchorage, Alaska, for undertaking quite possibly the DIY project of the year. 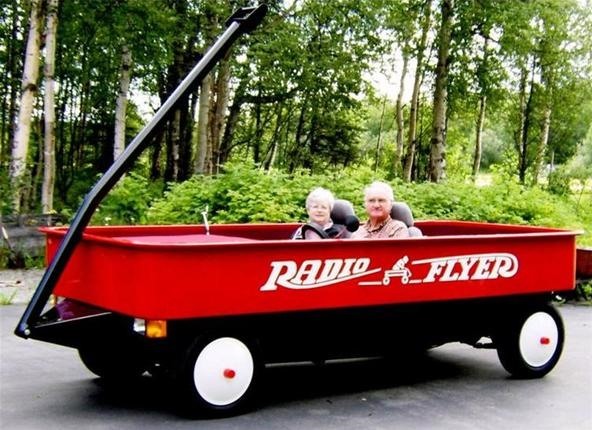 The retired couple spent 11 months converting a 1976 Mazda pickup truck into a gigantic radio flyer wagon car. "'I think the words I hear the most often is 'awesome' or 'cool' or people go by and give us a 'hi' sign,' says Foster. 'The wheels are made from hub caps and detergent bottles, and the steering wheel is the actual wheel from a wagon. The handle rises eight feet high.'" This is one of those idea, where someone would say "hey wouldnt it be cool/funny if we made a replica/giant ______". But not many would actually follow through, so props for these 2.